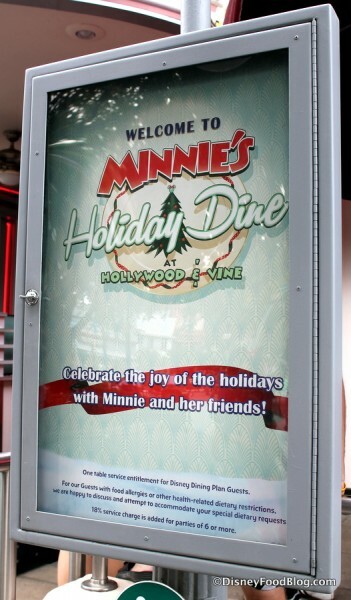 It’s time to Eat, Drink, and BE MERRY at Hollywood & Vine for MINNIE’S HOLIDAY DINE! 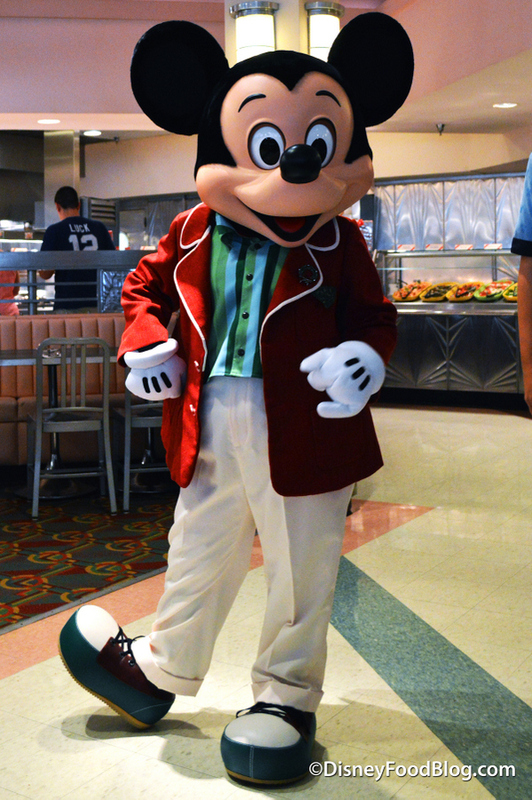 This past weekend delivered the debut Minnie’s Seasonal Dine Character Meals in Disney’s Hollywood Studios. 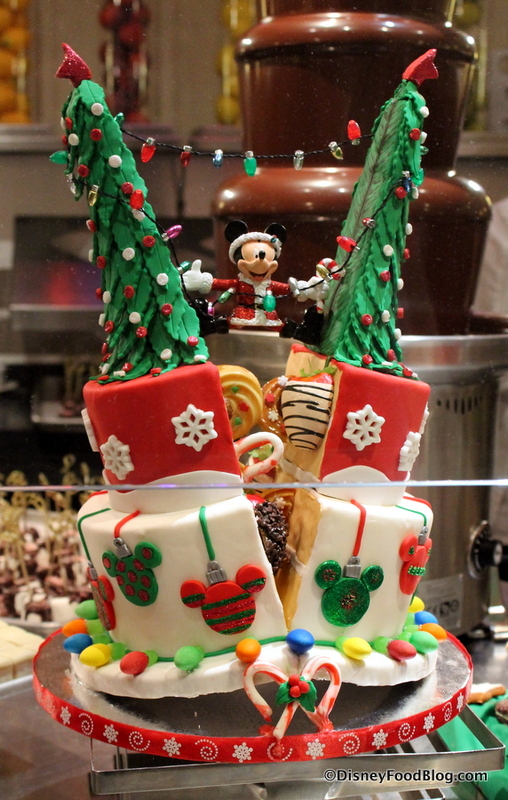 From now through January 3, 2016, dinner at Hollywood & Vine is a holiday meal, offerings guests the very unique opportunity to celebrate the season with a few of our favorite Disney pals! 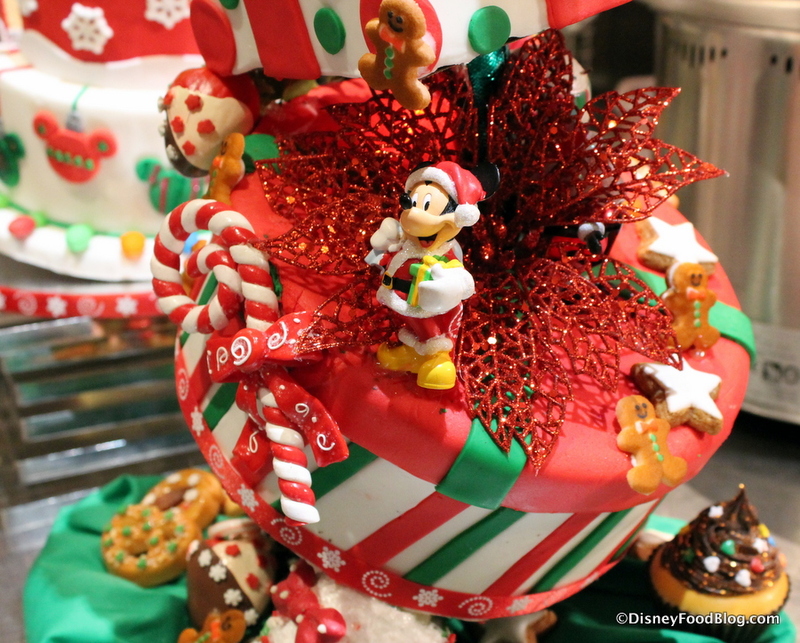 Once the holidays wrap up, dinner parties with Minnie Mouse and friends will continue; however, the theme will change with the seasons! 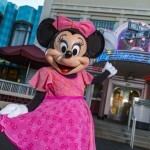 Starting January 4, 2016, Minnie and the gang will host a celebration of Hollywood and the movies. Spring, summer, and even Halloween will have themed celebrations of their own; and decor, music, and even certain menu items will change along with the party theme. 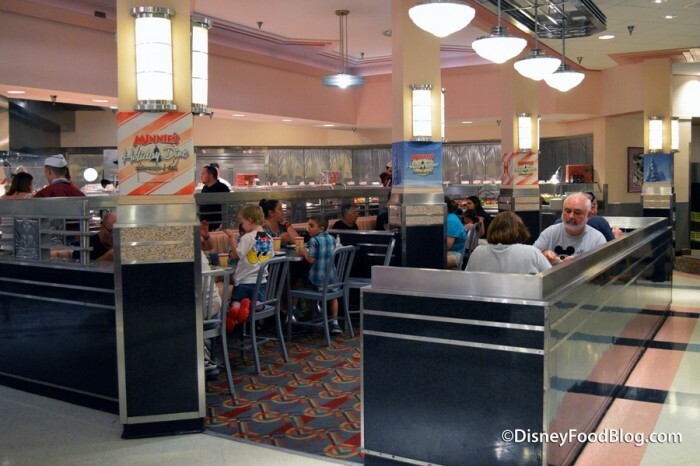 This isn’t the first time Hollywood & Vine has changed things up from its typical non-character buffet dinner (breakfast and lunch, it should be noted, will continue to feature Disney Junior pals at Play ‘n Dine). 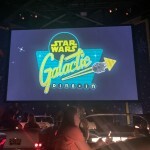 Hollywood & Vine has played host to themed, seasonal character dinners in the past with Jedi Mickey’s Star Wars Dine, held in conjunction with Star Wars Weekends for the past two years. 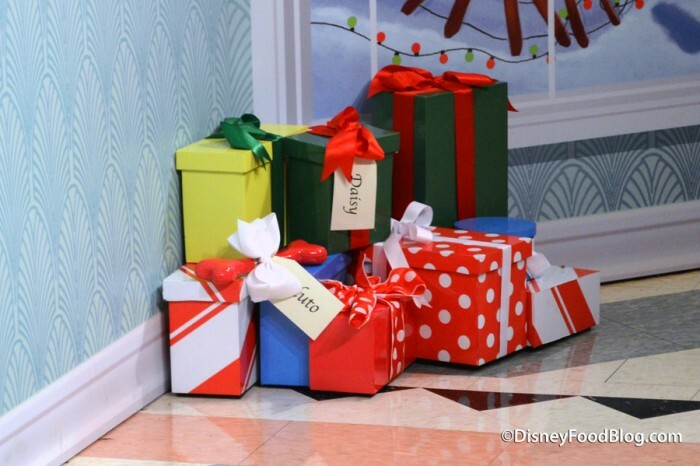 …and we’d love to share a little bit of it with you today here on the DFB! 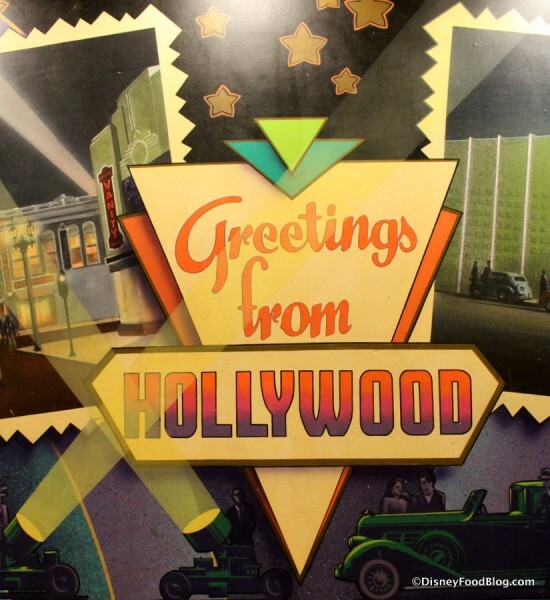 The day-to-day setting at Hollywood & Vine is that of a “Cafeteria to the Stars” for the Studios, featuring art deco decor complete with wall murals and photo images celebrating vintage Hollywood. However, some decking of the halls was in order for the occasion… starting right at the entryway with SANTA GOOFY! Of course, when he saw my camera, he just had to take a moment to primp first 😉 . 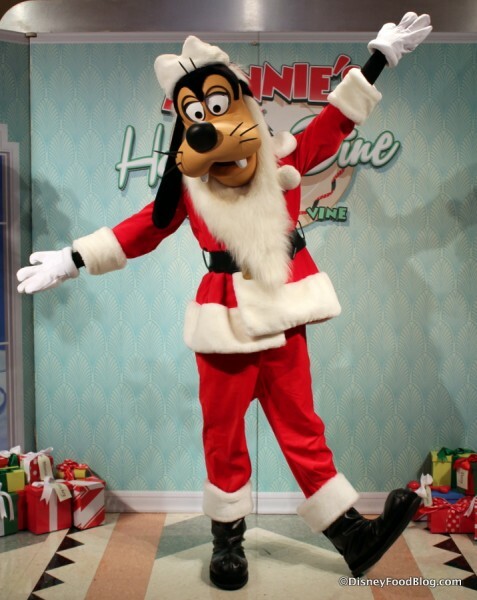 Every family or guest has their picture taken with Goofy immediately upon arrival. A PhotoPass photographer is present to capture the scene, but the character attendants also offered to snap a picture with our personal cameras. Beyond this point, the decor did not change immensely throughout the restaurant, but some festive elements were placed on top of the buffet stations and at various points around the dining areas. 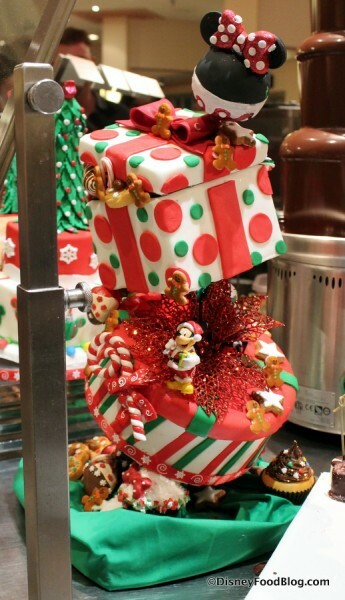 The showstoppers are the gorgeous decorative cake scenes placed in front of Hollywood and Vine’s very own Chocolate Fountain. 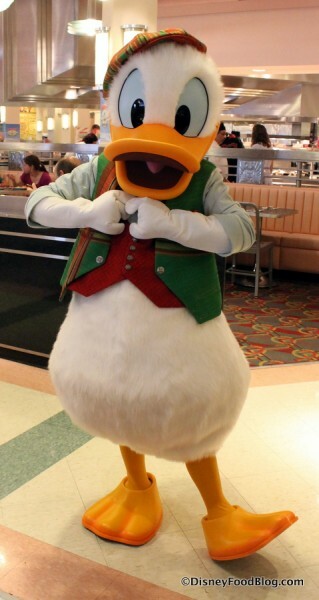 But the main thing delivering the yuletide glow to Hollywood & Vine is the presence of CHARACTERS for this meal. And they’ve donned their finest holiday garments to mark the special occasion (the fancy duds you’re about to see are all brand new). 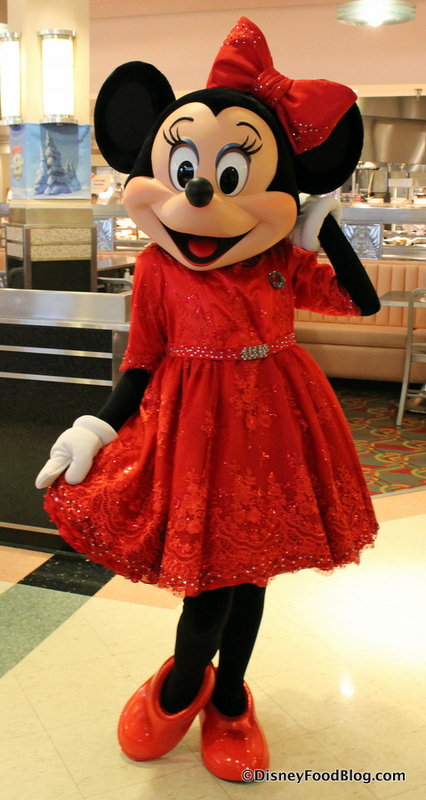 Let’s start with the Hostess with the Mostest… none other than Minnie Mouse herself! She’s in her festive best from the bow on her head right down to her sparkling shoes! 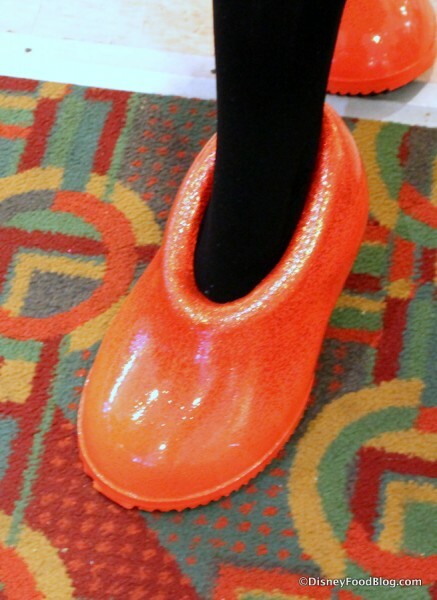 …especially since his best girl, the always stylin’ Daisy Duck, joined in the celebration, too 🙂 . Don’t you love her outfit? While Santa Goofy remained at the entrance to greet each guest, the other four made their way around to every table. I was pleased with the character interaction — our first visit from each character was the lengthiest, but even after the initial round the characters continually stopped by to wave or give a quick hug to my friend and me, even as they were on their way to other tables. More importantly, it seemed like a lot of attention and hugs went to the children around us. 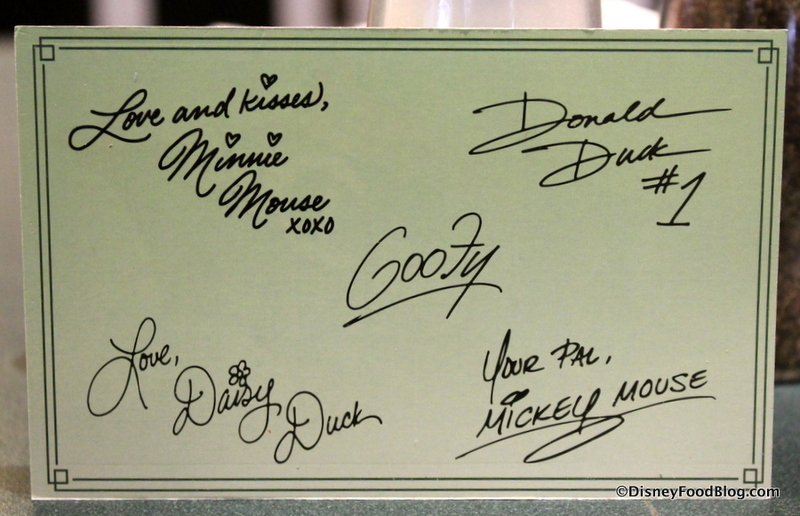 I’m not 100% certain on this, but I don’t believe I saw any characters sign autographs. It was mostly hugs and pictures. It could also be that children weren’t asking for autographs as much because we all received an autograph card upon sitting down at our table. In addition to the regular meet and greets at the tables, there were opportunities throughout the meal (with help from the intercom system) to sing along with various holiday tunes (“Jingle Bells” and “Deck the Halls” among them), march like a Toy Soldier, and get up and “BOOGIE” to some more holiday music (I may or may not have busted a move with our girl, Minnie). 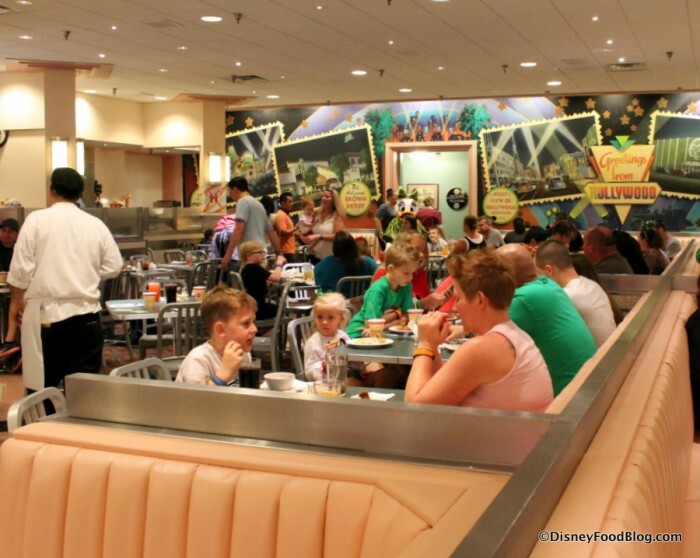 Guests who have attended the Disney Junior Play ‘n Dine for breakfast or lunch may be accustomed to periodic sing-alongs when all the characters gather together and invite the kids to sing and dance with them. 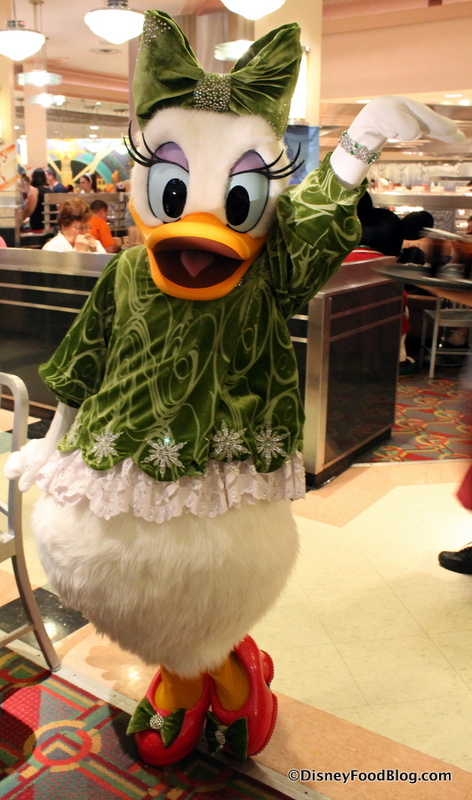 For Minnie’s Holiday Dine, the characters were still dispersed throughout the restaurant in their meet-and-greets during the tunes, and danced along with the kids wherever they were at that given moment. Those moments of activity, as expected, definitely felt very children-focused — a lot like the Disney Junior Play ‘n Dine participation moments. However, my friend and I didn’t feel out of place at all. We weren’t the only adults-only table in the place, and I wouldn’t hesitate to recommend it to any adults interested in having their pics taken with these characters. Overall, there was plenty of festive fun going on, and I have to say… even with this bizarre return of August-type weather we’ve been having in Central FL, it really was enough to put you in that special holiday mood! 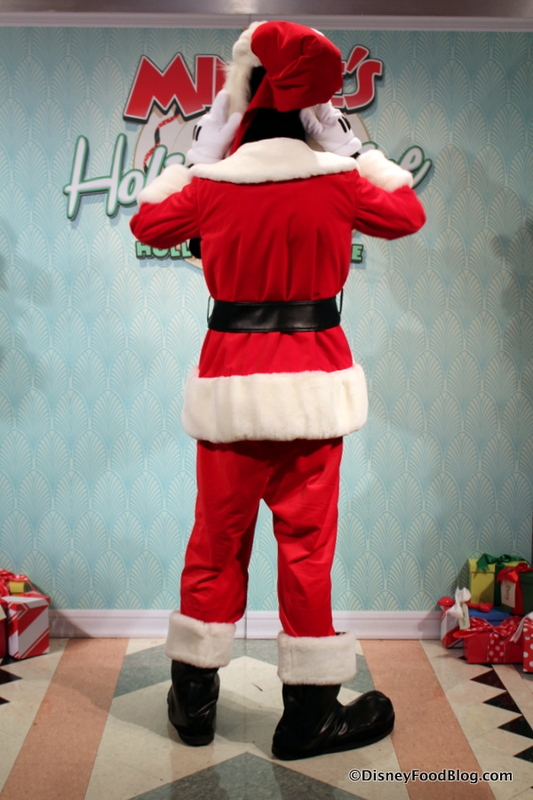 So, yes, there’s plenty of yuletide cheer to go around. There’s also plenty of food! 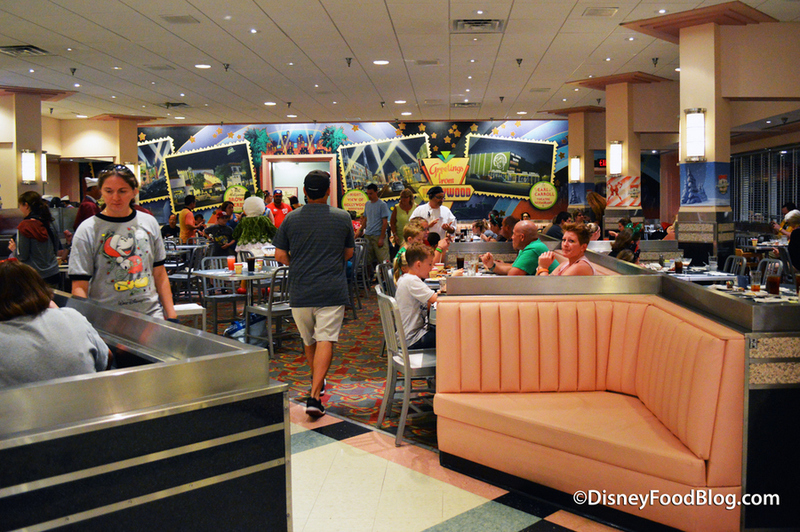 As always, all dishes are served buffet-style at Hollywood and Vine. 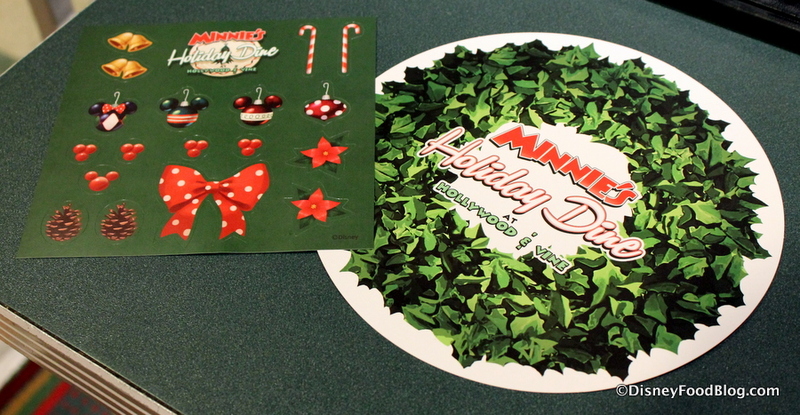 When Minnie’s Holiday Dine was originally announced, Disney mentioned that there would be seasonal items on the menu to reflect the celebration. 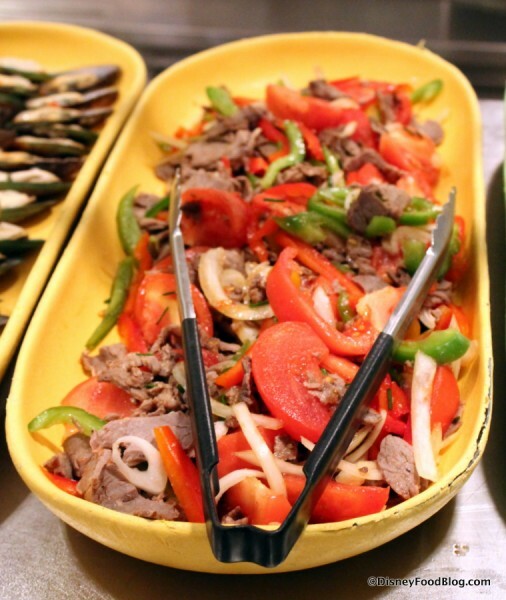 I expected that it would primarily feature the regular buffet items featured during lunch, with a small additional selection of turkey, stuffing and the like. 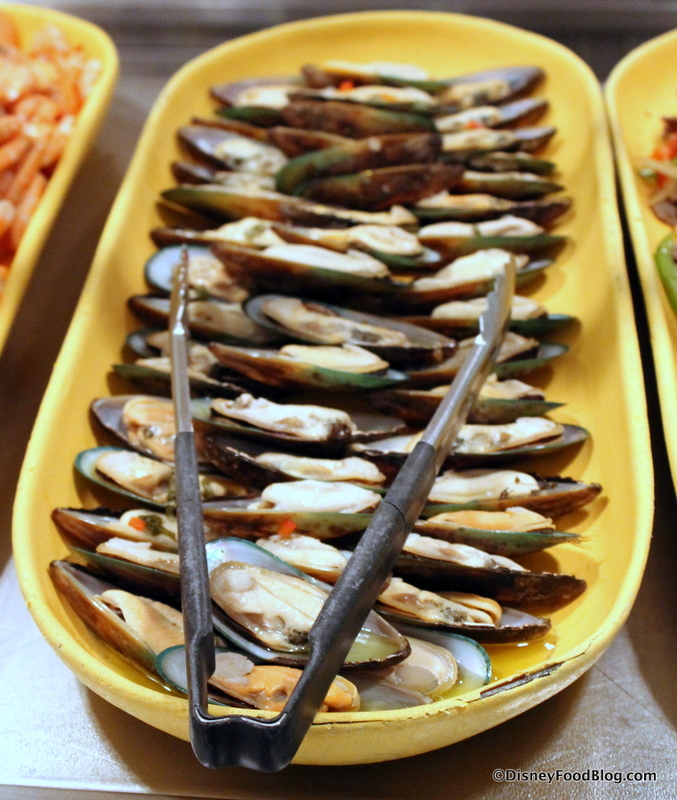 I was pleasantly surprised, though, to find seasonal items interspersed throughout the buffet. It started with small touches, such as the fruity Cranberry Butter available to go along with the Dinner Rolls at the Bread Station. Pretzel Bread (woot!) and additional condiments were available as well. 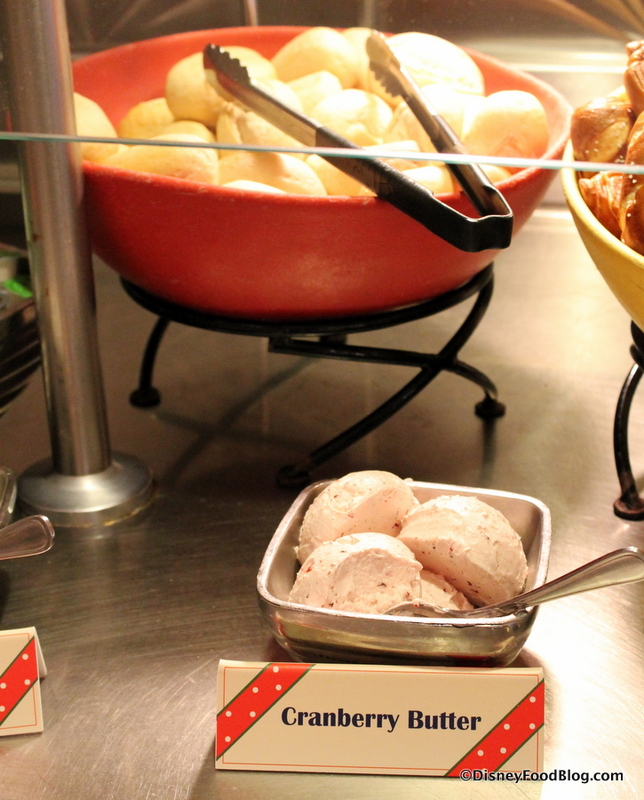 I liked the Cranberry Butter combined with a bit of the regular whipped butter for a little mix of sweet-and-salty. The salad selections began with a Quinoa Salad with dried fruit, Broccoli Slaw, an assortment of cherry tomatoes, cheddar cheese, and dressings (Italian and Ranch). 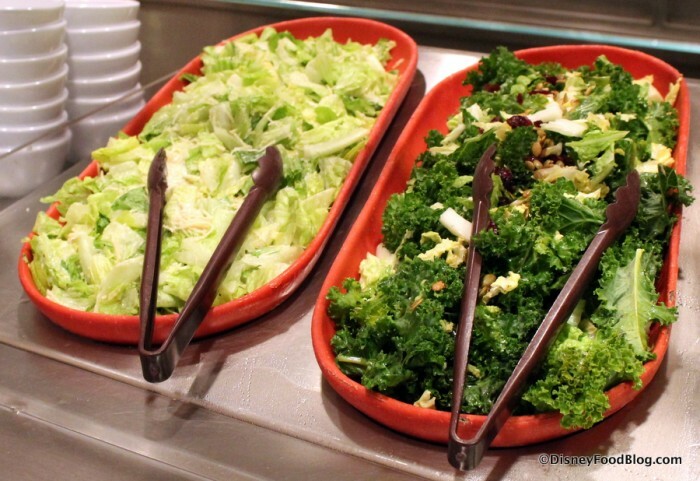 A traditional Caesar Salad and a less-traditional Winter Kale and Cabbage Salad with pumpkin seeds and dried Craisins rounded out the salad section. The featured soups were Vegetable Soup and Roasted Butternut Squash. 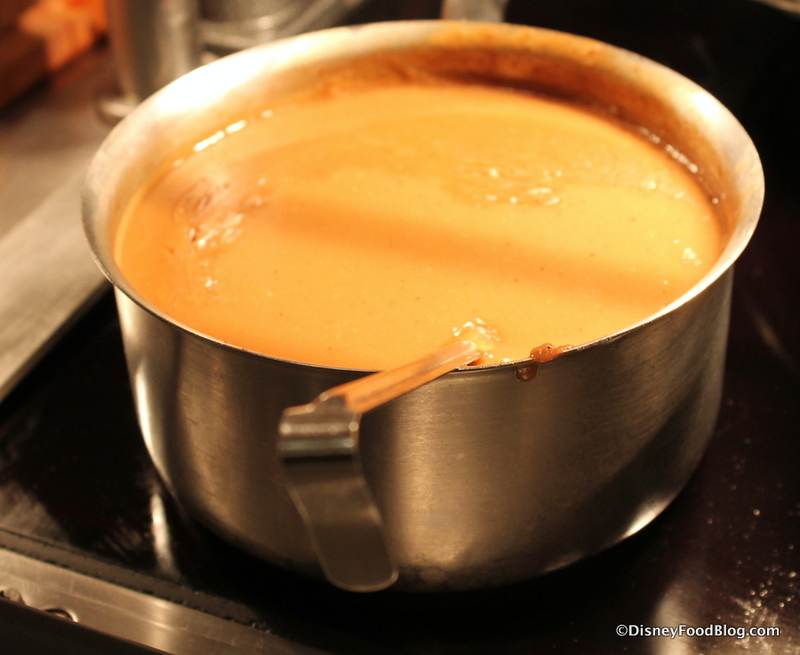 Since that picture of a covered tureen probably doesn’t help you much 😉 , here’s a shot of my bowl of Roasted Butternut Squash Soup, one of my favorite items of the meal. Creamy and buttery, with just a hint of autumnal spice. The Cold Bar offerings started with a Pear and Pomegranate Salad with shaved fennel and arugula. 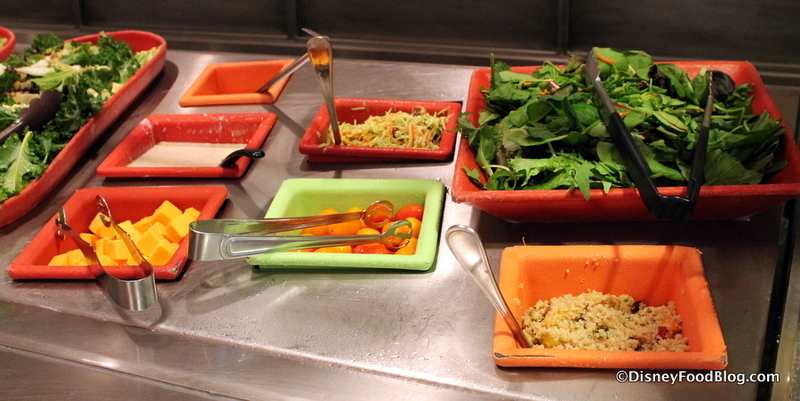 I typically don’t go for a whole lot of salad at buffets (go figure), but I found this one to be a nice, refreshing change of pace. 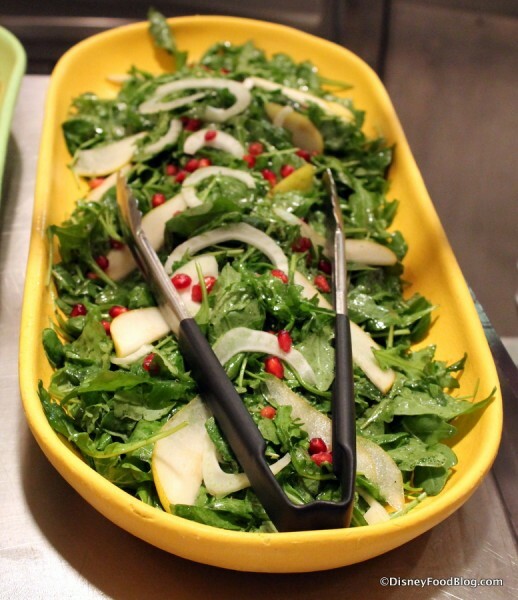 The pomegranate seeds lent a good bit of crunch — with a festive red color, to boot — and the sweet pear balanced the more peppery flavor of the arugula. Other choices at the Cold Bar included Insalata Caprese, Beef Salad (served with a mix of peppers, onions, and tomato), New Zealand Green Mussels, and Shrimp with Cocktail Sauce. 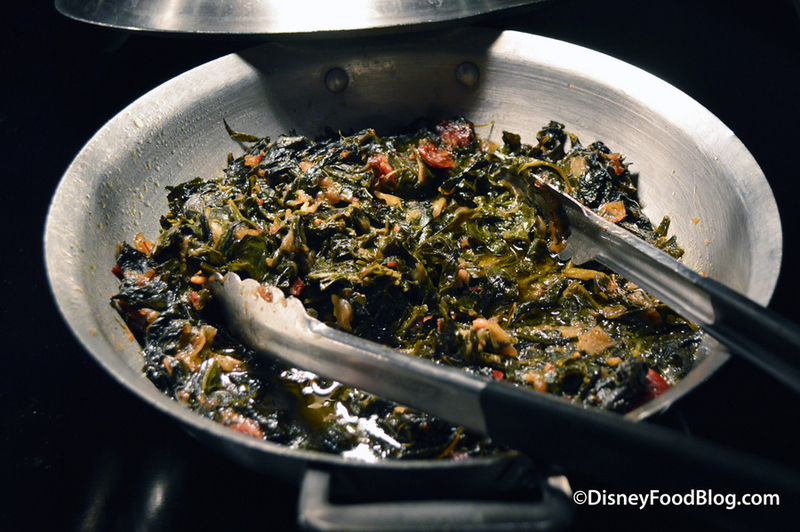 The hot buffet selection began with Collard Greens. 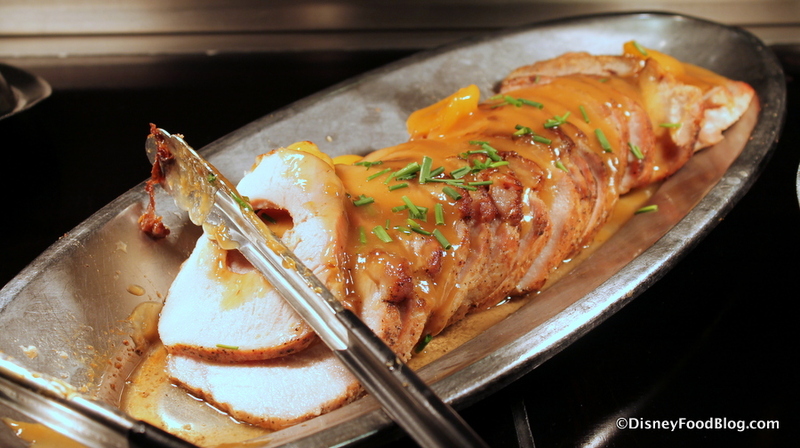 The fruity glaze offered a tangy touch to the Apricot Roasted Pork. 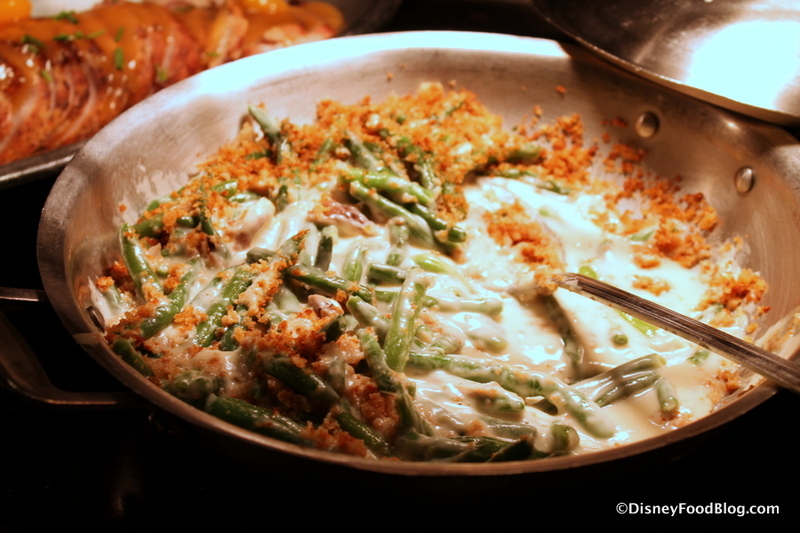 Next up is that perennial holiday must-have… Green Bean Casserole! I’m responsible for this one every year at Thanksgiving, and it’s pretty much the at-home version that everyone makes, with bread crumbs instead of good ol’ fried onions. 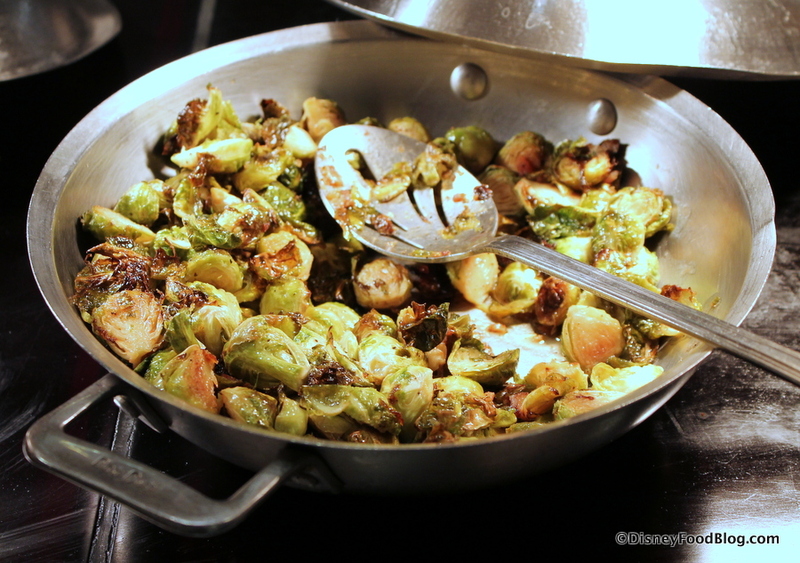 Aaaand we have Brussels Sprouts. I ate one for you, Mom! One. 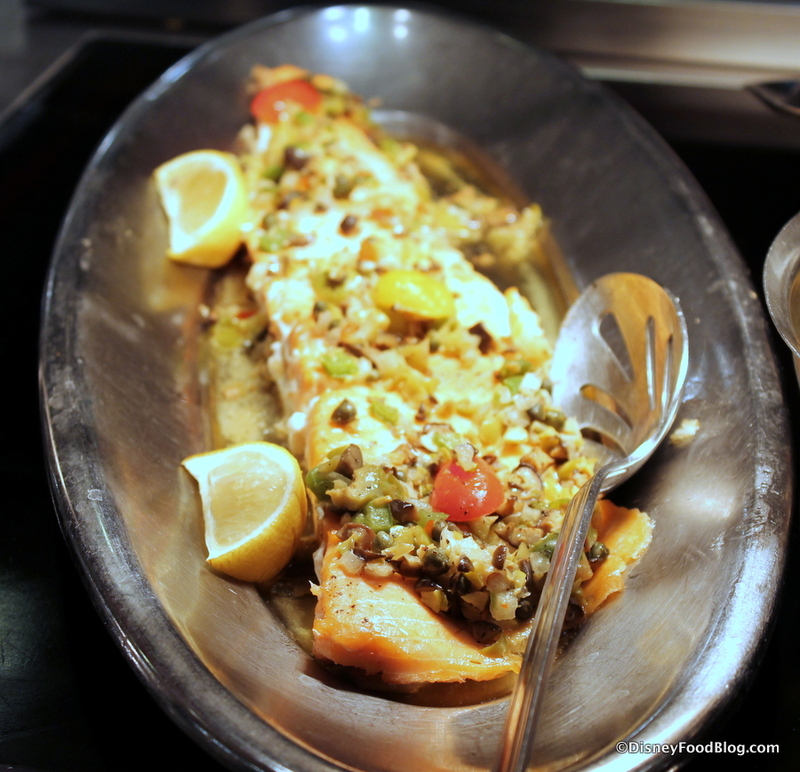 Verlasso Salmon was the Sustainable Fish of the Day. 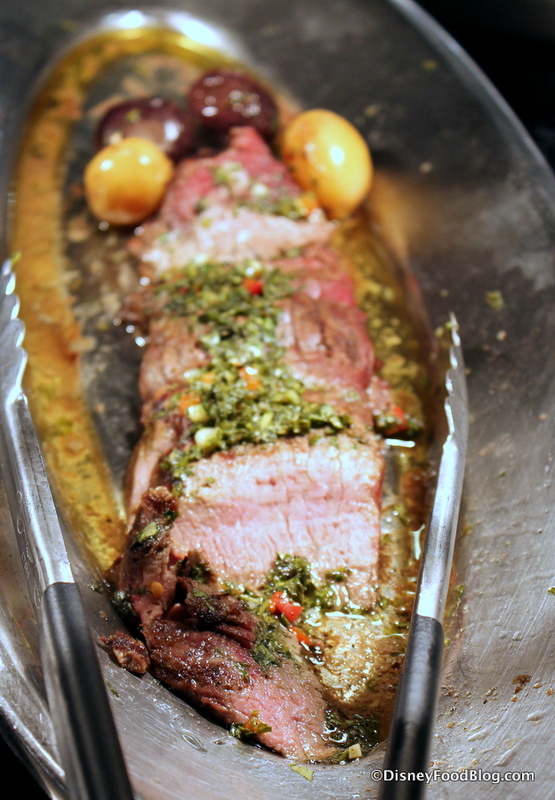 I honestly didn’t think much of the looks of the Marinated Flank Steak in the serving tray, so I was happily surprised to find it so well-prepared — both tender and flavorful. 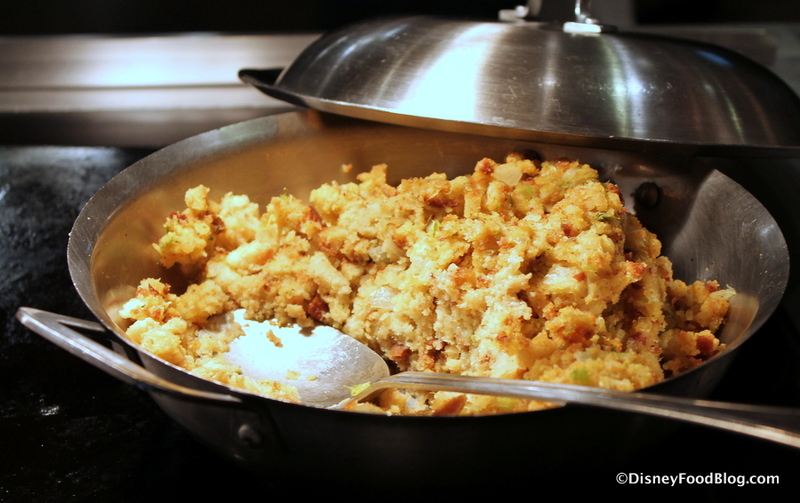 The Cornbread Stuffing takes the place of the usual Corn Spoon Bread found here. The cornbread flavor didn’t stick out to me too much, but it was very well-seasoned, complete with celery and onion. My friend went back for seconds of the Sweet Potato Casserole — she loved it, naming it one of her favorites of the meal. Meanwhile, I went back for seconds (okay, thirds) of the Garlic Mashed Potatoes. There’s an interesting take on the Fish and Chips dish: the fish are more like breaded fish nuggets, while the “chips” are tortilla chips as opposed to french fries. 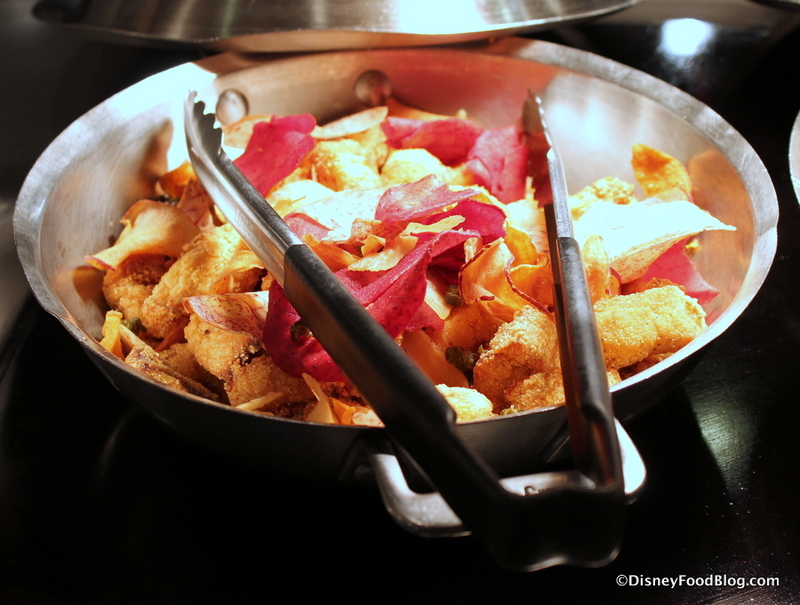 I wasn’t a huge fan of this combo, personally, but since the nuggets tasted a lot like frozen fish sticks, it’s likely one of the more kid-friendly items on the adult buffet. 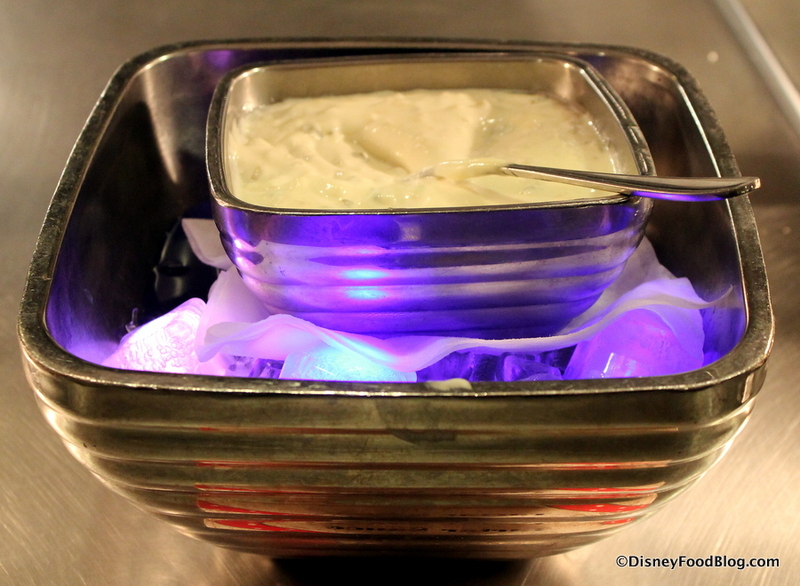 If you like Tartar Sauce with your “Fish and Chips,” you’ll find it on ice… including some of the famous Disney souvenir glow cubes. 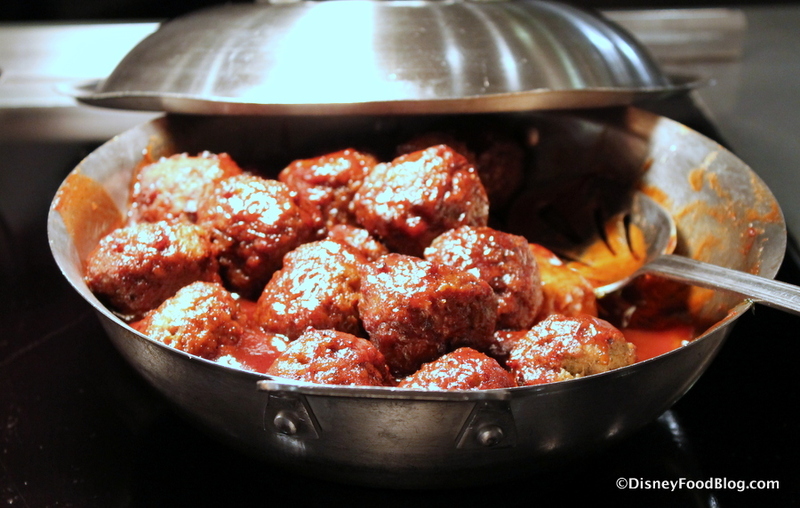 I was glad to see a couple of Hollywood & Vine signature dishes… my favorite Barbecued Meatballs, along with the hit Shrimp and Lobster Macaroni and Cheese. 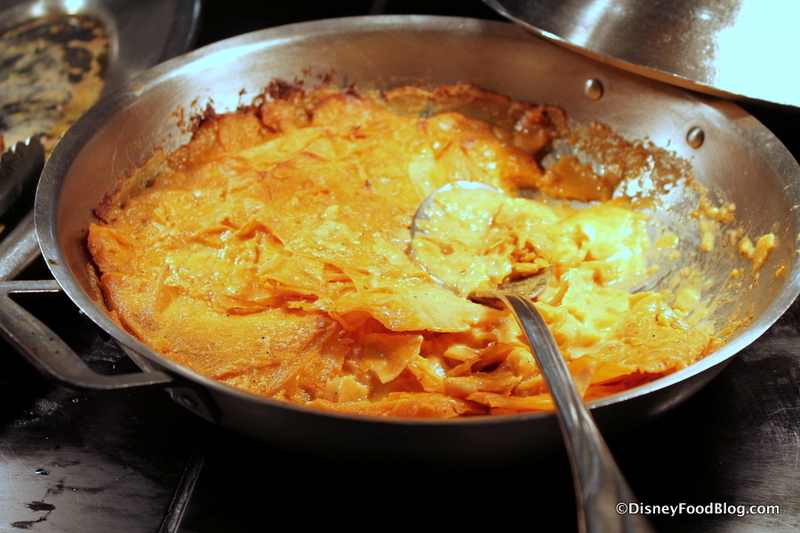 Here’s the thing with the Pumpkin Ravioli: while it’s definitely a pumpkin pasta dish, it’s not a stuffed ravioli. It’s actually a pumpkin gnocchi. 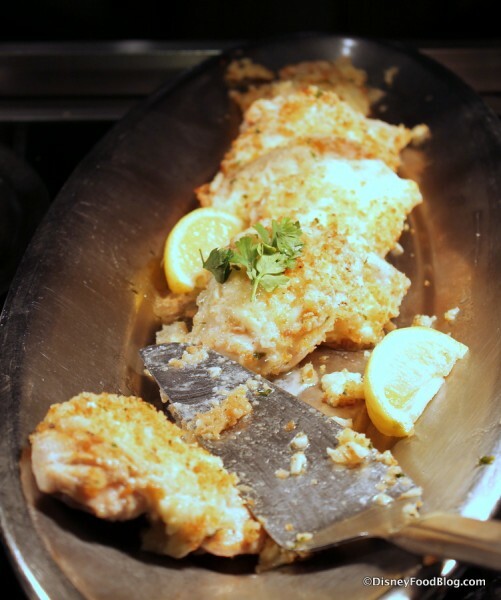 The creamy Asiago Ranch Chicken Breasts complete the buffet entrees. 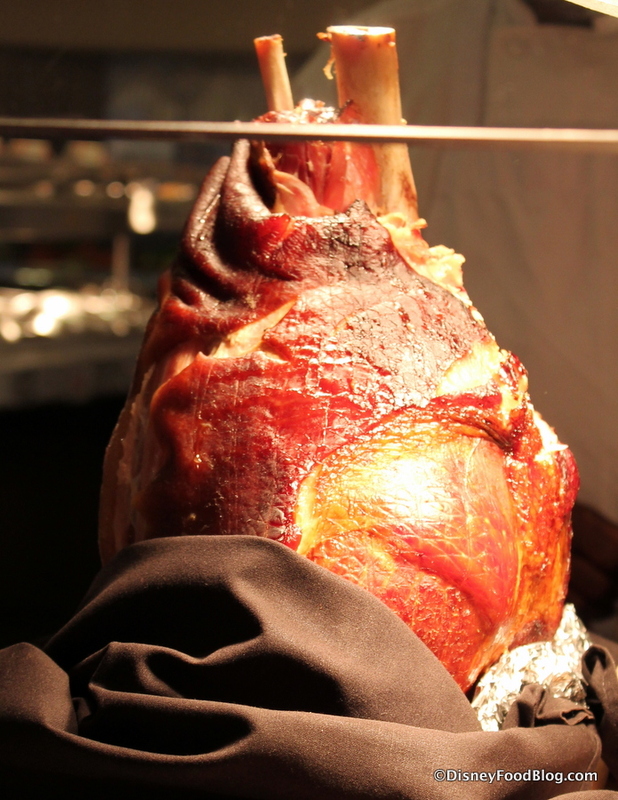 The Carving Station features two meats. 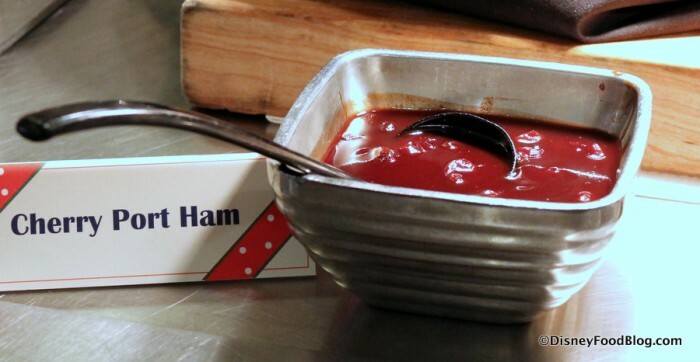 The Ham was cooked with a Cherry Port Glaze. I tried the Honey Bourbon Turkey with a bit of the Cranberry Sauce. I didn’t pick up on a ton of the honey bourbon flavor, but the turkey was hot, juicy, and tender. 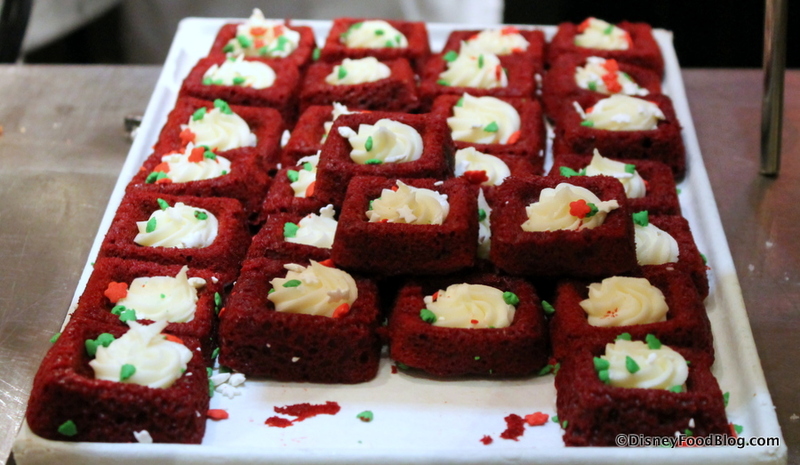 Unfortunately, though, I could only handle a few bites because I had my eye on the Dessert Bar. 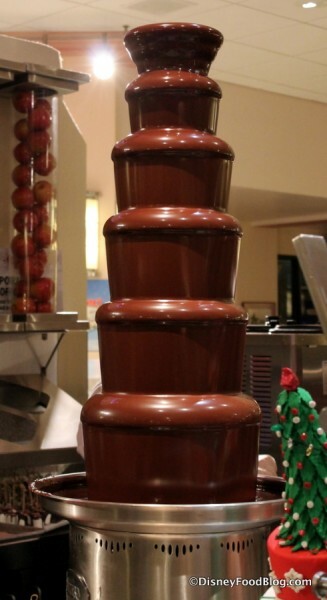 Before we check that out, though, let’s take a quick look at what’s up for grabs on the Kids Buffet. The first side (well, depending on the side of the restaurant you’re seated on, that is 😉 ), featured most of the simpler fare: Rice, Roasted Potatoes, Pasta, Baked Chicken, and Carrots. The next station featured several Disney buffet tried-and-trues: Mac and Cheese, Broccoli, Chicken Breast Nuggets, Tater Tots, and Corn Dog Nuggets. If you’re an adult, though, and feel the need to sneak some Mac and Cheese or Corn Dog Nuggets from the kiddie fare… well, join the club. Why should kids get all the Corn Dog Nuggets, anyway 😉 ? One of the highlights of lunch or dinner at Hollywood and Vine is the Dessert Station. The Chocolate Fountain assures you that you’ll always find some sort of chocolate-dipped treats, but there are plenty of other mini-items available to choose from as well. Here’s another look at the displays placed in front of the Fountain. 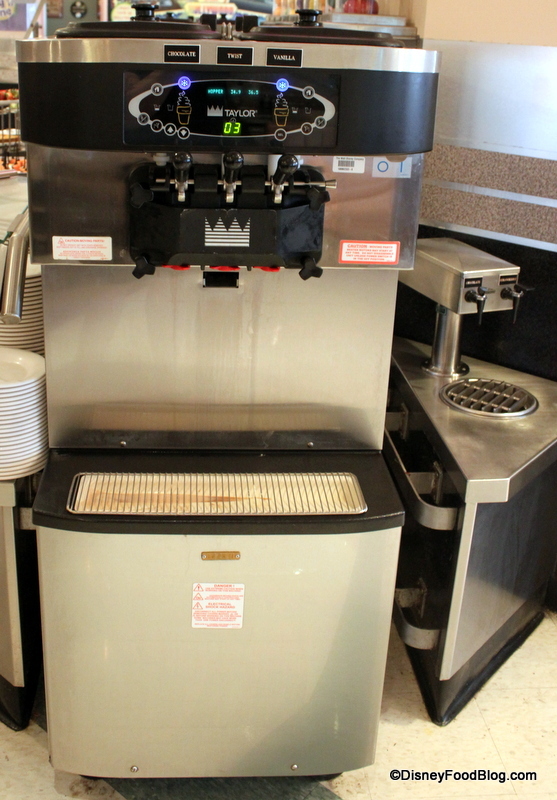 In addition to Soft-serve Ice Cream from the self-serve machine (chocolate, vanilla, or twist), mini desserts are available in abundance. 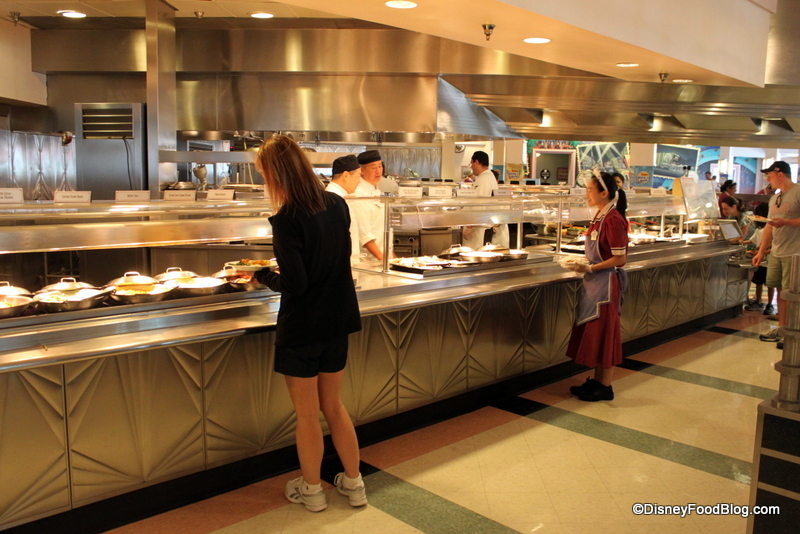 Unlike the main buffet, where you’ll find the buffet repeated to serve either side of the restaurant, be sure to look at the full dessert station because each side has different items. The line up for Minnie’s Seasonal Dine included Chocolate Peppermint Bark, for starters (more of a brownie/cake/fudge version as opposed to the typical candy). 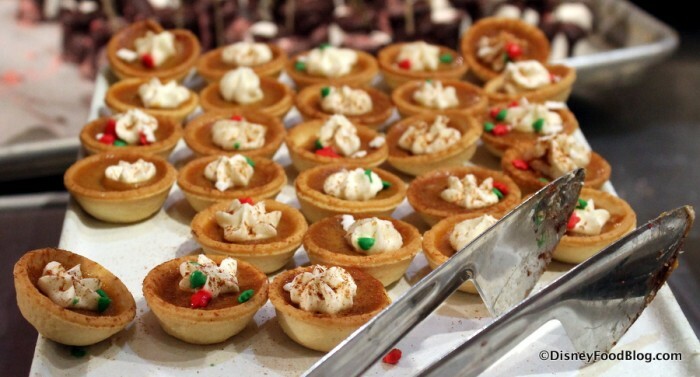 I’m not sure if the Mickey Pecan Tarts are typically Mickey-shaped, or the name simply implies that the Big Cheese just really likes him some Pecan Tarts! 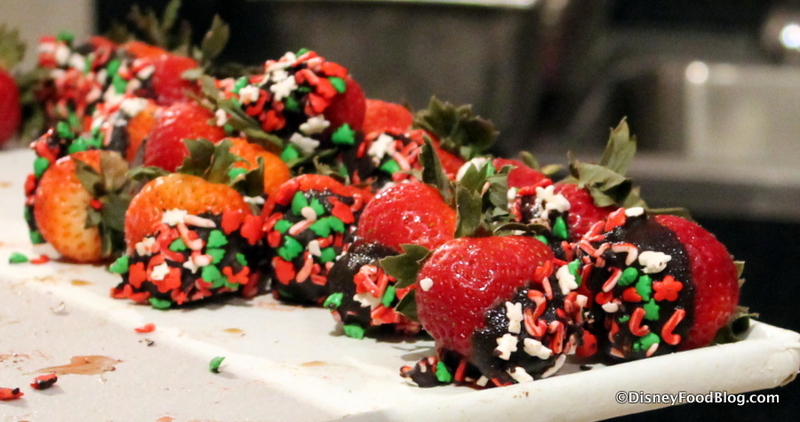 The Candy Cane Chocolate-dipped Strawberries were on the small side this go ’round (but I’m guessing that has to do with the fact that we’re no longer in strawberry season). 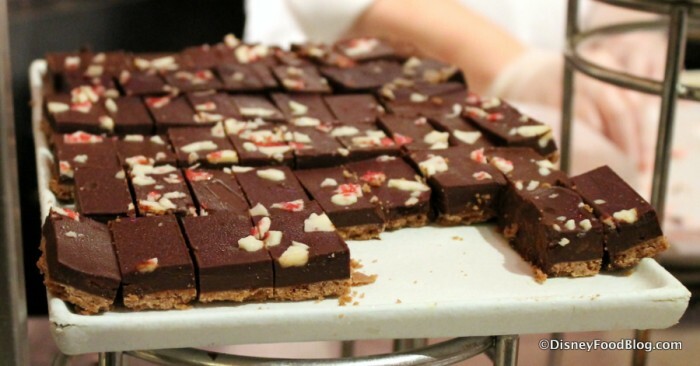 These weren’t minty from a flavor perspective — the candy cane name is inspired by the festive sprinkles. I loved the Pumpkin Tarts with Cinnamon Dust — they’re itty-bitty pumpkin pies! The German Christmas Cookies actually varied during our meal. At one point, they were iced star cookies (you’ll see a pic on my dessert plate in a little bit), but when I returned to grab some more pictures, they had been replaced by the dense cookie-cakes you see below. 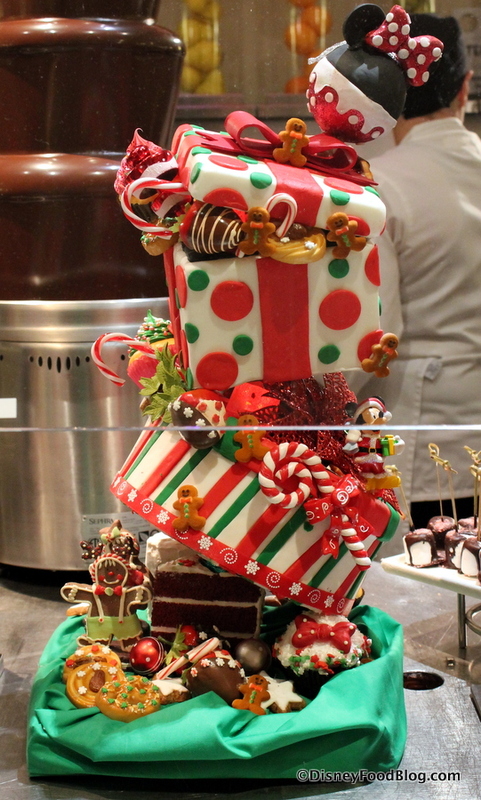 Let me tell ya, the Dessert Bar was hoppin’ the whole time, so I think there was some improvisation here and there to keep things full. 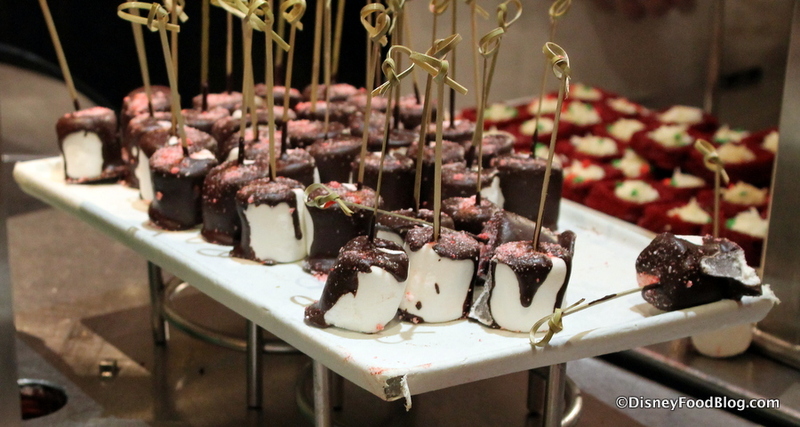 Another one from the “Chocolate-dipped” family… Marshmallows! The deep color of the Red Velvet Cakes definitely fit the holiday vibe. 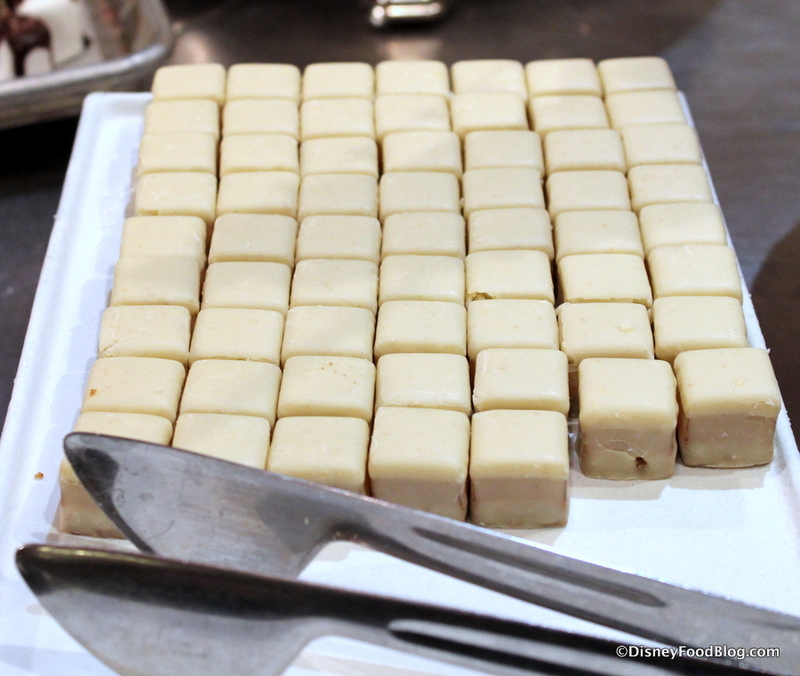 I didn’t really pick up on any extra spices in the Egg Nog Cheesecakes, but they were still delish. 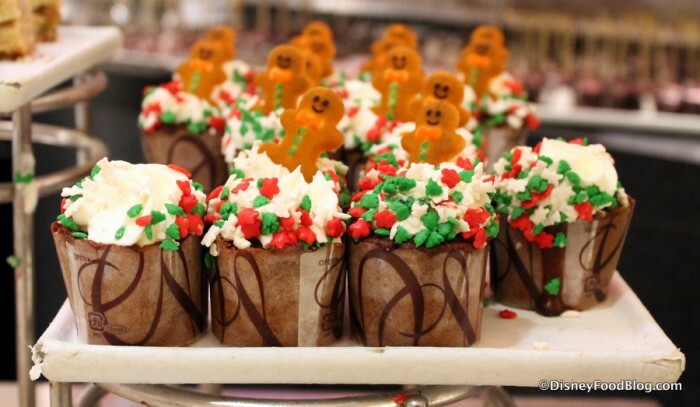 Hollywood Studios makes a mean Gingerbread Cupcake with cream cheese icing, and these mini versions topped with little gingerbread men did not disappoint. 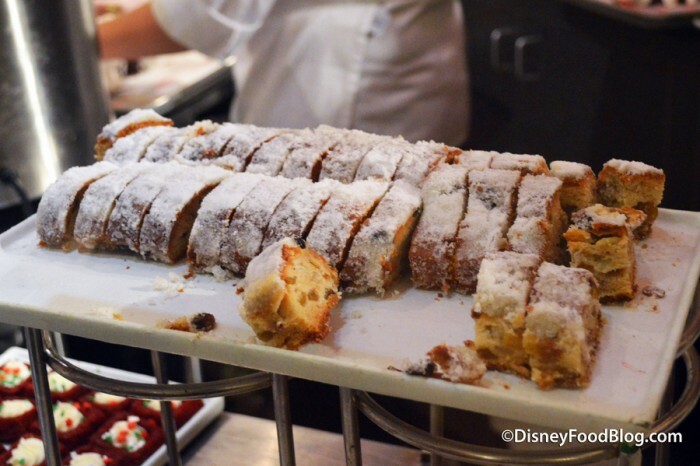 While this may not appeal as much to the kiddos, I thought it was so fun to see Stollen — a German fruit bread dusted in powdered sugar — on the dessert bar. 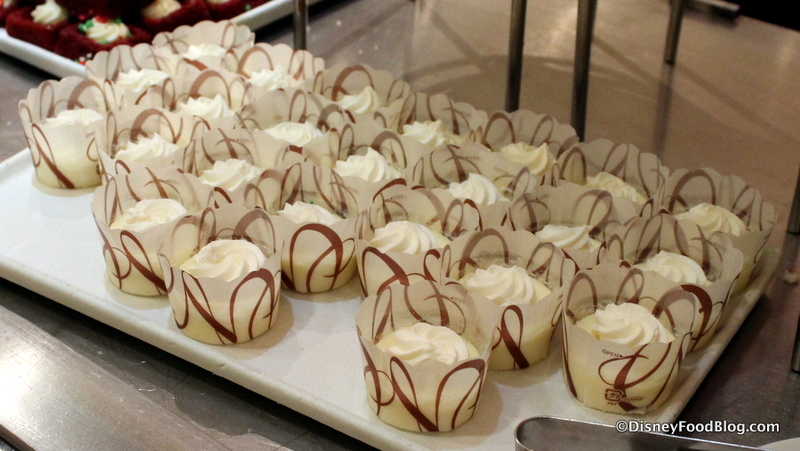 Go ahead… grab one of each! 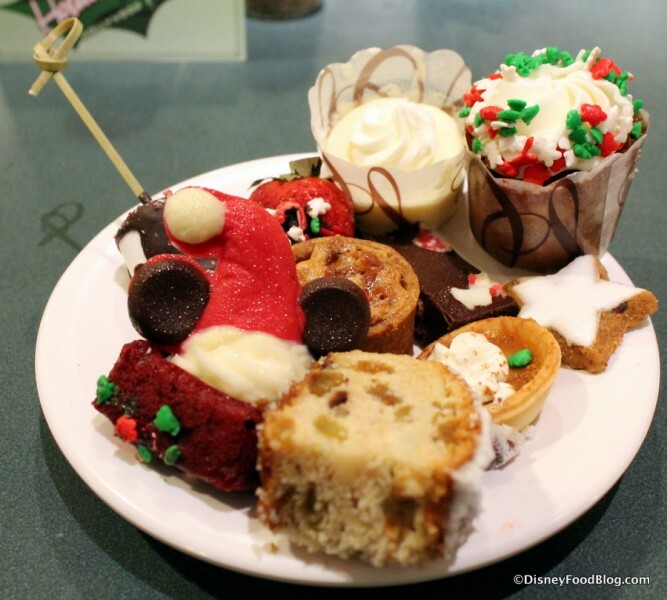 Full of both food AND holiday cheer 😉 , it was time to leave Minnie’s Holiday Dine… but not before we were given a little parting souvenir. If you are planning on attending the event with your little ones, you might want to consider bringing along a folder to store the paper wreaths and stickers you will receive. It will be fun for the kids to “decorate” the wreath with the ornament stickers after the fact and remember their time with Minnie and the gang at the Holiday Dine. 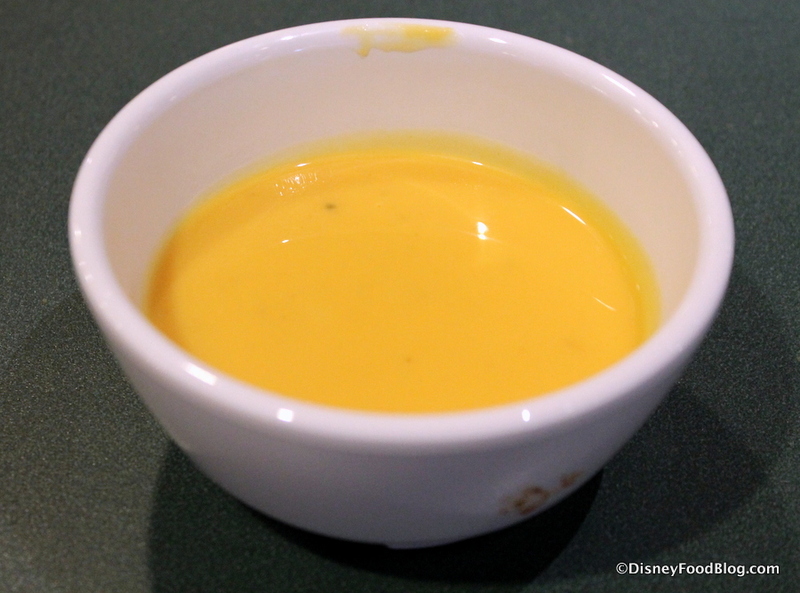 Much like my experience at Jedi Mickey’s Star Wars Dine, I really enjoyed Minnie’s Seasonal Dine. As with any character meal, getting photos with five characters — especially THESE characters — is no small thing, and the special holiday wear and festive spirit do give the occasion a little something extra special. 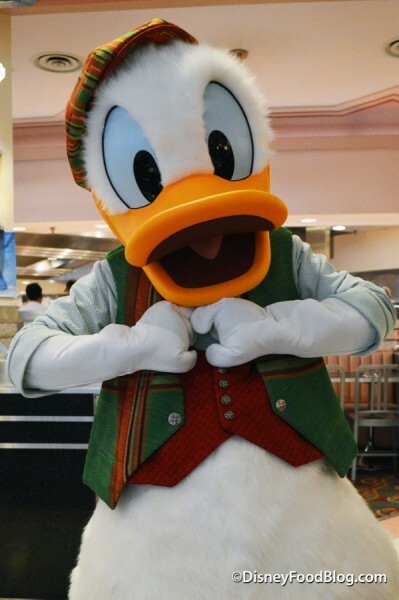 I noticed that a few families came dressed for the occasion in holiday wear — from simple red and green t-shirts or holiday Mickey and Minnie ears, to some children dressed in full-on holiday garb for their photo with the characters. It’s a great opportunity to get that Christmas card pic you might be hoping to get during your vacation. Though there hasn’t been a full transformation of the restaurant, it still fun to see the extra touches and hear the music — it feels like just enough for a real holiday vibe. And I think the buffet, specifically for this meal, has a great mix of seasonal favorites served alongside some of those Hollywood & Vine staples. A few good things to know! 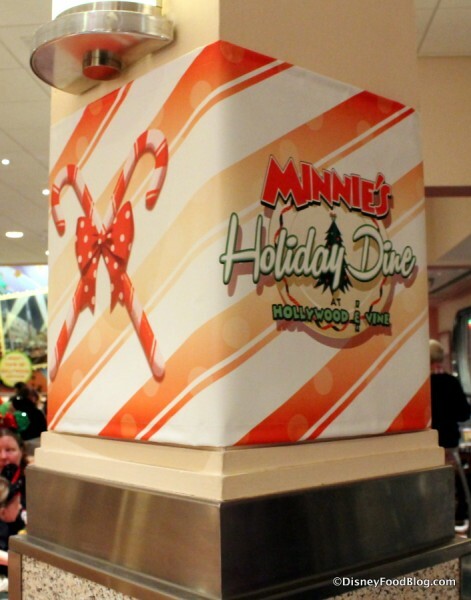 The cost for Minnie’s Holiday Dine is $46.99 for adults, and $27.99 for children, plus tax and gratuity (or 1 Table Service Credit on the Disney Dining Plan). 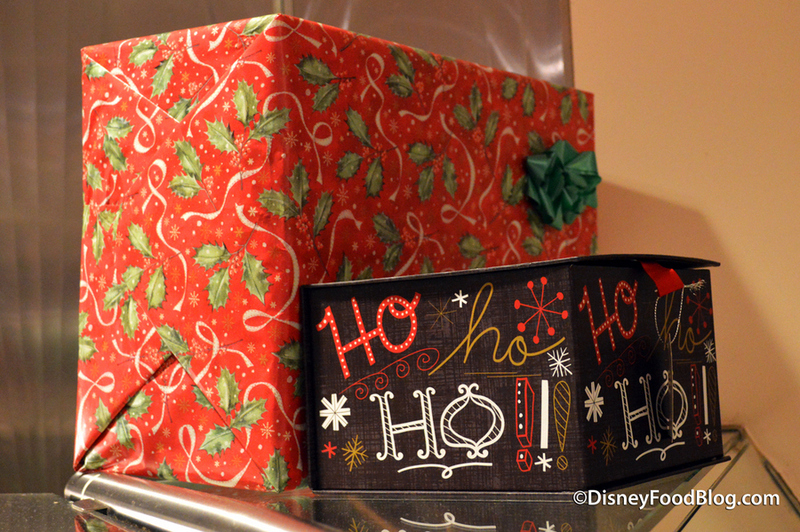 Minnie’s Holiday Dine is also available to be booked with the Fantasmic! Dining Package options at $53.99 for adults, and $31.99 for children, plus tax and gratuity. 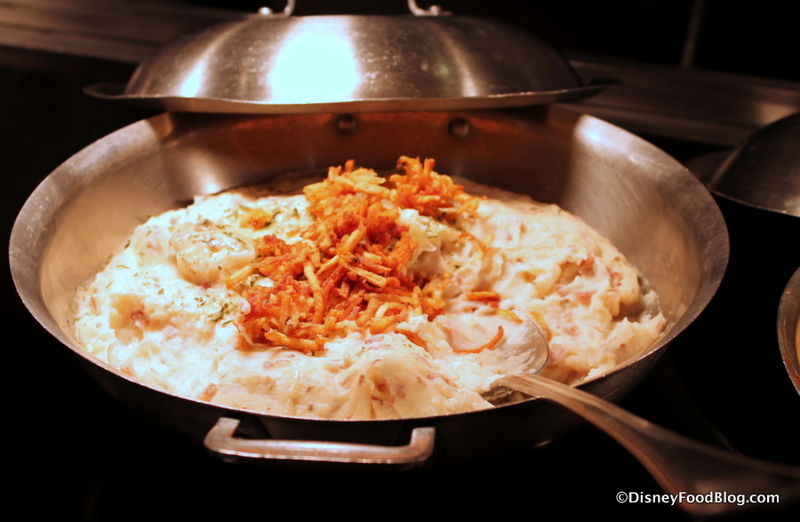 Early information suggested that this popular event filled up quickly in its opening days of booking, but it’s always worth checking to see if an Advanced Dining Reservation has become available due to cancellations (you can use the links to Walt Disney World Dining included in this paragraph or call 407-WDW-DINE). 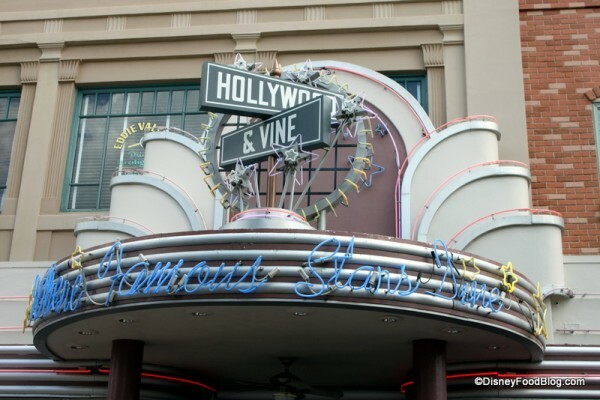 However, even if you should miss out on Holiday Dine, remember that Minnie and friends will be hosting dinner at Hollywood & Vine for the long haul, thanks to the addition of Minnie’s Seasonal Dine (please note that there will be a price increase for the children dining with the Fantasmic! package to $42.99 with the Seasonal Dine). Thats’ right — we now have all-day character dining at Disney’s Hollywood Studios! So, get ready to celebrate the festivities no matter which season you plan your next (or perhaps first) dinner at Hollywood and Vine! 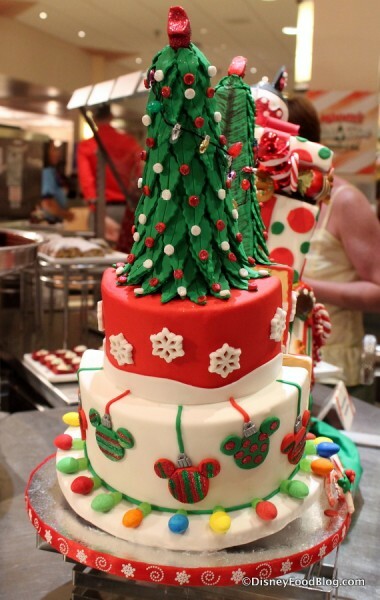 Will you be celebrating with Minnie this holiday season? Let us know in the comments below! HI! 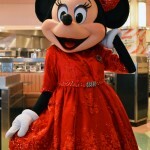 I am really anxious to book the Minnie’s Seasonal Spring Dine from March 21st onward. Any word on when booking might open up for this? I am a big planner and all other ressies are made! Thanks so much for posting this review! I have been eagerly awaiting information on this meal! I’m going in December and I am so excited! One question, about how big is the wreath they give you? I’d like to have a folder big enough to get it home safe and sound. Thanks!! 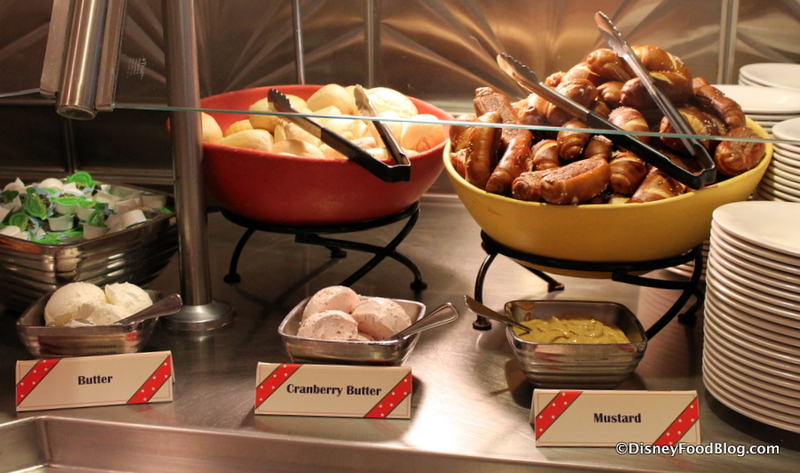 I love all the different food offerings! I’m impressed by all the seasonal items they have out. Thanks for sharing! Do you know if the TIW discount is available for this meal? WOO HOO! Can’t wait for our reservation! THANK YOU for doing a review!! That food looks fantastic! Hollywood and Vine is one of my favorites. We will be sure to hit up this dinner on our next trip! Hollywood & Vine is one of my favorites. 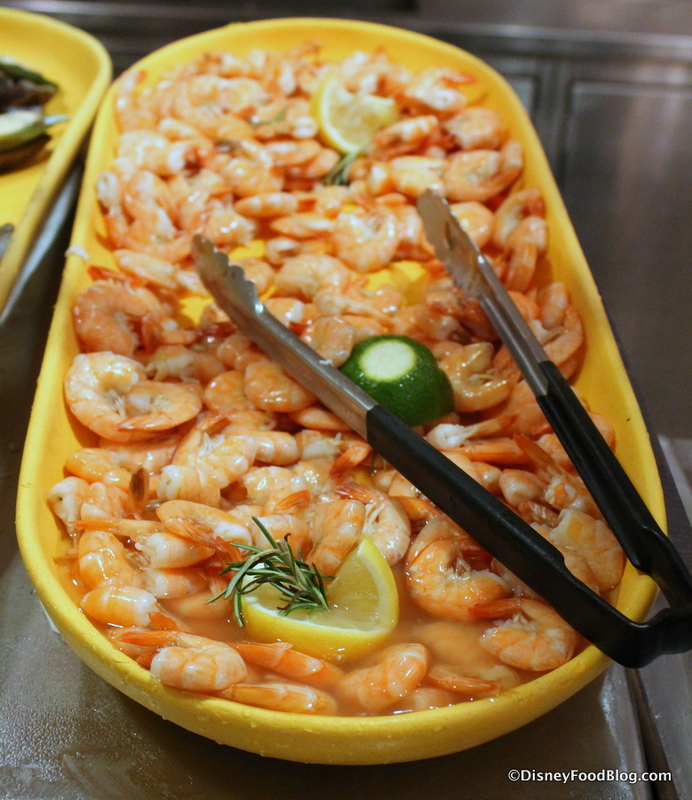 I loved the Shrimp and Lobster mac ( I hate Shrimp btw) it was probably my favorite thing I had. They have a great variety of food so I’m sure everyone can/will find something they’ll like. We have three different reservations for while we are there (couldn’t decide on the best day & time) and I had planned to drop two but now we are planning to go for our first reservation and decide whether or not we want to keep one or more of the others. 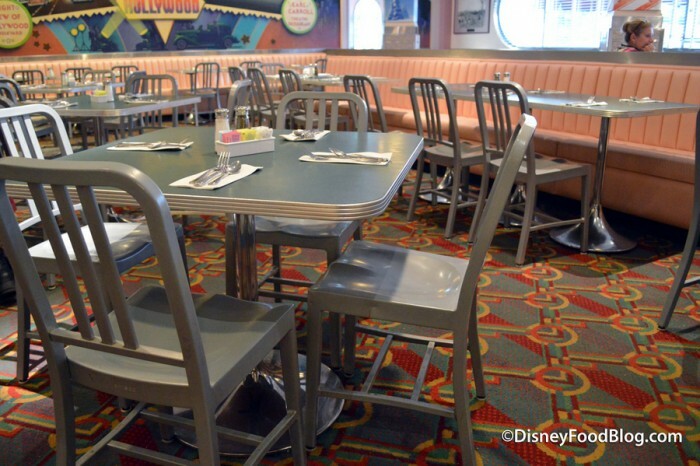 We were able to snag the free dining plan so we’re making sure to get our money’s worth this go round! The food looks delicious, I can’t wait! Rebecca — I’m trying to confirm, but there are no indications on the Tables in Wonderland site that it isn’t. However, Fantasmic Packages aren’t available with Tables in Wonderland discount, so keep that in mind. 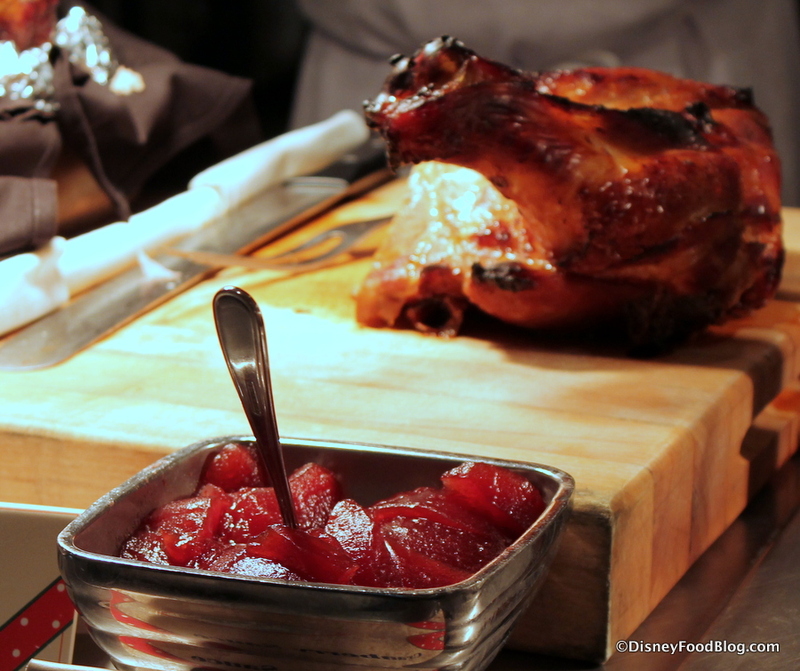 I have the fantastic dinner reservations for the Minnie’s holiday dine on 12/7. Will they check my confirmation number and give me some sort of ticket or voucher for fantastic? Review was great, thanks. I’m darn near ready to book a flight just for this meal. Everything looks fantastic. Thanks for the info. Now I’m starving. We went on 11/7 and weren’t offered the wreath and stickers. Oh well. Also, it was actual pumpkin ravioli for us. 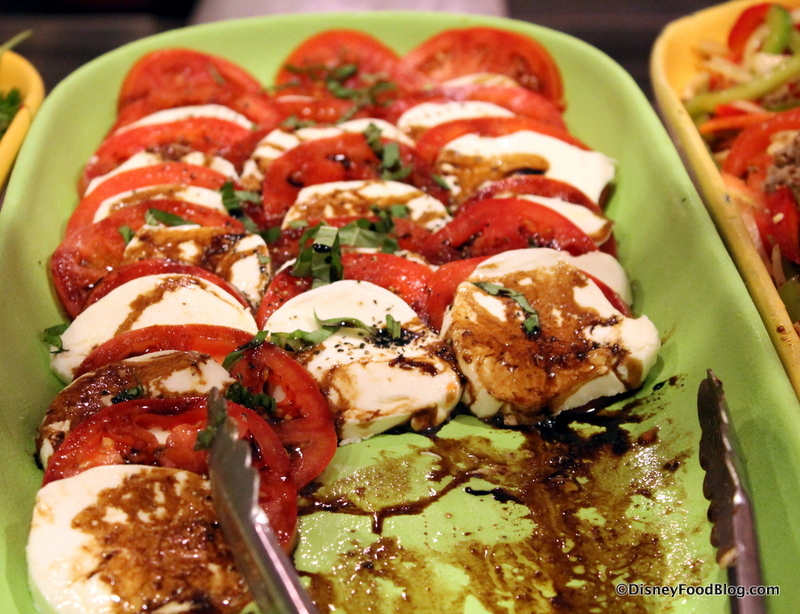 It was totally delicious but I love gnocchi and would have loved to sample that too! I am so glad I booked this now. I initially booked it for the characters only as the last few times I’ve eaten there it was terrible. This looks like a huge improvement on the food. Charles — Unfortunately, they haven’t released anything about that yet. The Disney site still says “Booking not yet available” for the Spring dinner as of today. Our best estimate is based upon the fact that they opened the next Hollywood-themed one for booking on Oct 27, and that one starts Jan 4th. So, just a shade over 2 months in advance. We are guessing that they’ll eventually open this to 180 days like everything else, but for right now, the 2-month guideline, based upon our experience, is what we have to go on. Hope this helps! Love ur site…..hate the advertisement banner. Please remove it. I’d like to go; the food looks good and character meals are always fun. It certainly looks nice and festive and I love their Christmas outfits! Also, an after thought; Disney may not think that it’s a big deal, but that autograph card and the wreath and stickers are great. They may be financially nominal, but little extras like that are nice and add special memories to scrapbooks and photo albums. I for one think those little extras leave guests with that ‘special’ feeling for which WDW had been known (i.e. : souvenir buttons, etc). The single Brussels Sprout anecdote was really cute. When I called to make my ADR, I was told that TIW is not available for this event. We were just there last week and the meal was fantastic! Our kids loved it and overall our family had a great time. We were the first family in and had a little extra time with Goofy Santa and a round of applause when we entered from the entire staff. It really made us feel at home. We went last night and were able to use our TIW discount. 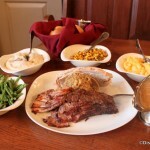 Charles – I was able to book for beginning of April. This review changed my mind from doing the lunch to the Seasonal dinner. Can’t wait! Thanks! So excited ! 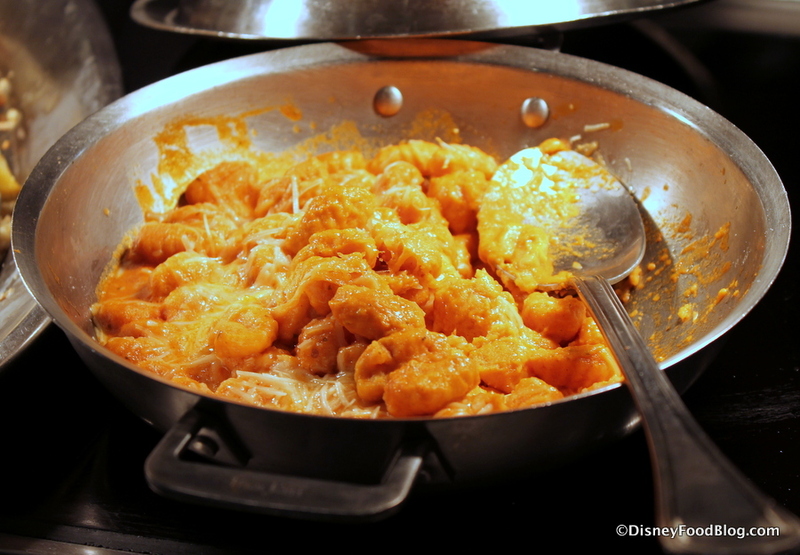 I just booked Minnies’ Seasonal Dine Fantasmic for 6 pm! YAY! I got it for March 26th! Can you use Table Service credit if booking Fantastic dinner party? Carrie — I just spoke with a Cast Member and Disney Dining, and she confirmed that you can use your Disney Dining Plan for all Hollywood and Vine meals, including Minnie’s Holiday and Dine. Got to go to Minnie’s Holiday Dine last week. Would i do it again – absolutely, I’m hopeful it was an off night, and THANK YOU DISNEY FOOD BLOG!!! If it wasnt for your post, my family would be without the hot chocolate and wreath! Rich — I’m so sorry the experience was a little underwhelming, but I’m super glad to hear that we were of help, and that your daughter had a great character experience! Thank you for letting us know about your evening, and thanks for reading! Yes! I, too, have this booked for the evening of Feb. 4th! I can’t wait to hear opinions of it before we go! Thank you for your blog! 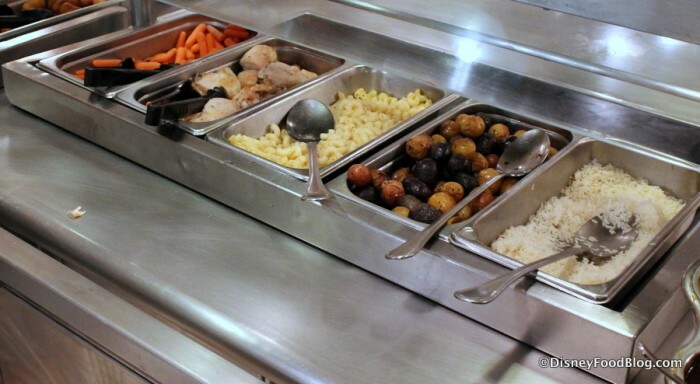 Didn’t see it in the review – do they still serve the beef stew from lunch at dinner? A few good things to know! The cost for Minnie’s Holiday Dine is $46.99 for adults, and $27.99 for children, plus tax and gratuity (or 1 Table Service Credit on the Disney Dining Plan). 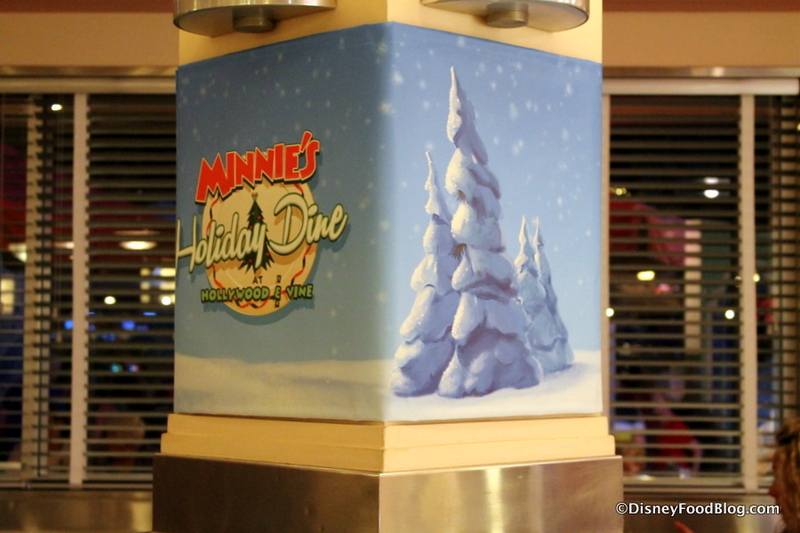 Minnie’s Holiday Dine is also available to be booked with the Fantasmic! 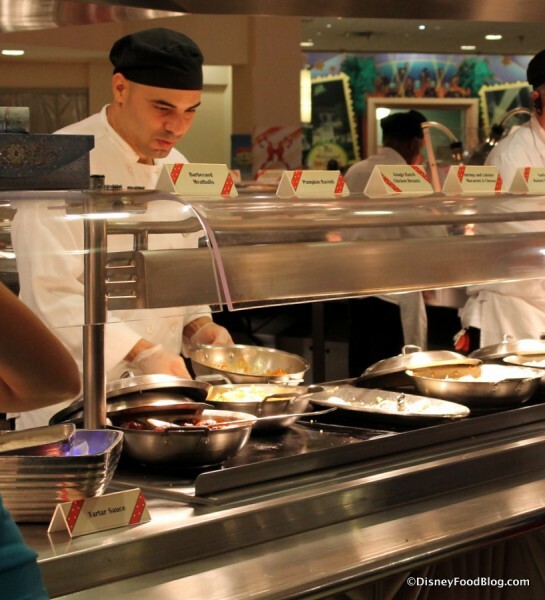 Dining Package options at $53.99 for adults, and $31.99 for children, plus tax and gratuity. It looks like the Holiday dine accepts the dining plan, my question does the the Minnie’s Holidy Dine with Fantasmic also accept the dining plan? 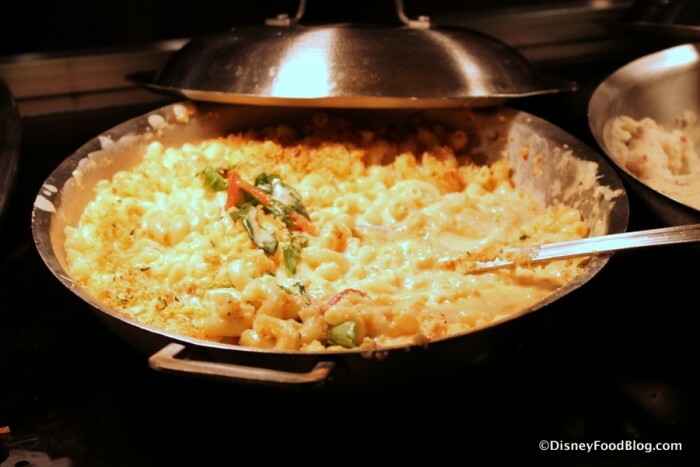 Michelle — The Fantasmic Package with dinner at Hollywood and Vine has been available on the Disney Dining Plan and should still be. I would confirm when you book, however. Thanks for your quick reply. I booked online, but I’ll give them a call to confirm. I don’t see it on the 2016 Disney dining plan pdf so I wasn’t sure. The Hollywood and Vine for Breakfast and Lunch are listed on the dining plan but not dinner, that I can see. 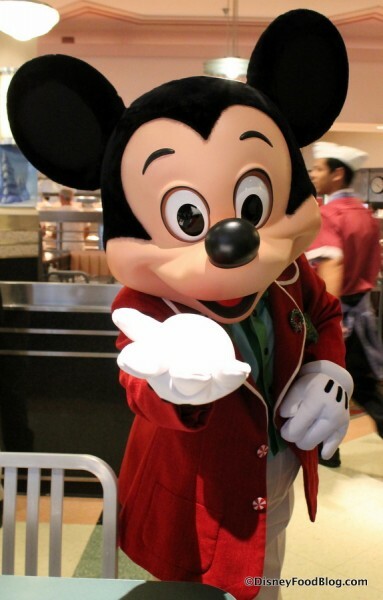 Can anyone tell me if they have pizza for kids at Minnie’s Hollywood & Dine dinners. I am going in May and I have a very picky eater and he mostly only likes pizza. Dinners are posted for May 2016 for reservations! Can anyone confirm that they do NOT do autographs? We booked this to get the autographs of the big 5 and now i’m worried we’ll have to change our reservation. I was curious as to how much time we should set aside for dinner? Trying to arrange FastPasses and have a 5:15 dinner reservation in January. 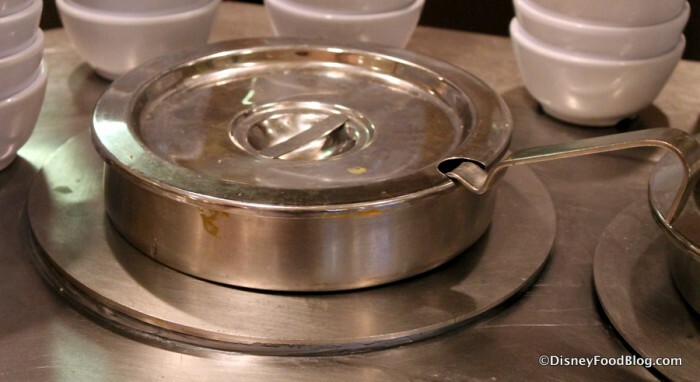 Tim — It’s a buffet, so service isn’t really an issue. It really comes down to how much time you’d like to spend. If it were me, I would budget at least 1 1/2 hours for character interaction, potential wait time, etc. Best of luck! We are going in Nov 2017 and are SO excited about this Character Dinner. Can you tell me please what time of the day they start serving the dinner? Can’t wait to make reservations!! Karen — Times may vary, but currently, dinner is from 3:00-7:00PM. Good Luck! Hi AJ, thank you AS ALWAYS for this very thorough and fun review! I pondered whether or not this was worth it because the food doesn’t seem to get positive reviews. I also didn’t know how to dress so now that I’ve seen the characters, I have a better idea! I booked our Minnie dinner for 11/19/17, and I was confused because my dining confirmation doesn’t indicate anywhere that I have a voucher for the VIP Fantasmic seating like it would have for Disneyland’s package. But when I booked it online, it would appear that its included. When I called, they said that Fantasmic is different and has to be booked specifically over the phone. Do you happen to have any information on that? Thank you! Rose, that’s a good question! 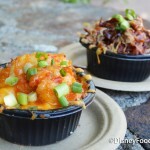 Minnie’s Seasonal Dining has two separate Fantasmic! options. The first is the Fantasmic! Dining Package, which provides reserved seating (you receive a voucher at the end of your meal). The second is the Fantasmic! Dessert and VIP Viewing Experience. These two things would need to be booked separately. Your best bet is to call Disney Reservations to confirm that you’ve booked the Fantasmic Dining Package (and if not, modify your reservation to add that, if you want) OR to add the Dessert and VIP Viewing if you want that. I hope this helps! 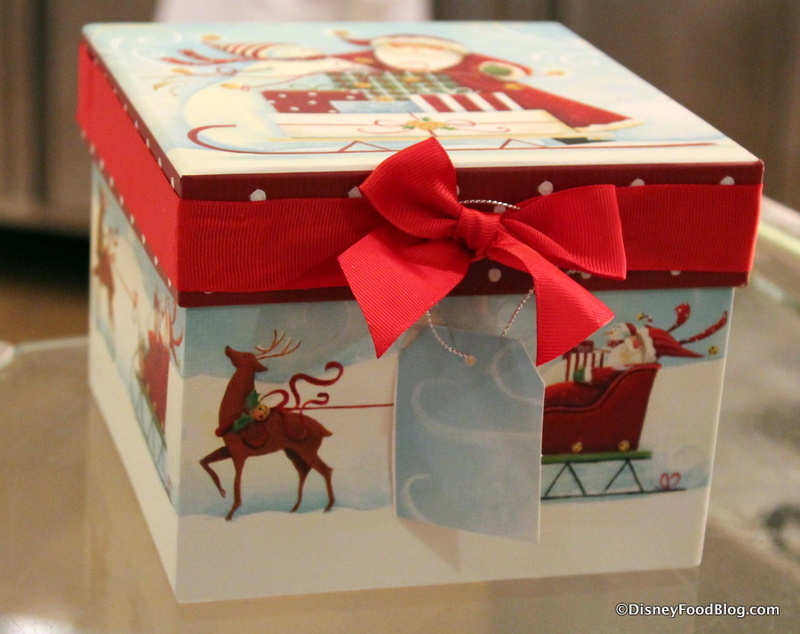 Patricia on What’s New at Disneyland Resort! Emotional Whirlwind Construction, Donuts, Plush Toys, and MORE!